At this point your holding needle has two stitches on it. 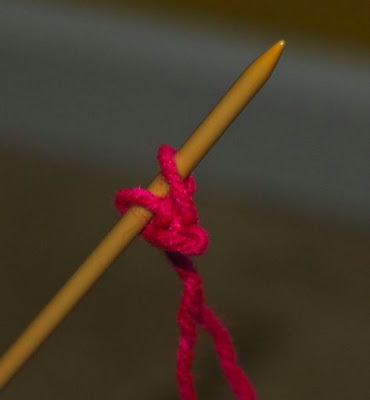 For the rest of the cast on stitches you will be working with the loop or stitch closest to the tip of a knitting needle. To make the third cast on stitch you will put the tip of the working needle between these two stitches. Slide it up, through the loop closest to the tip of the holding needle, and under or behind the holding needle. Tuck the working needle in to the belt, to free up your hand. 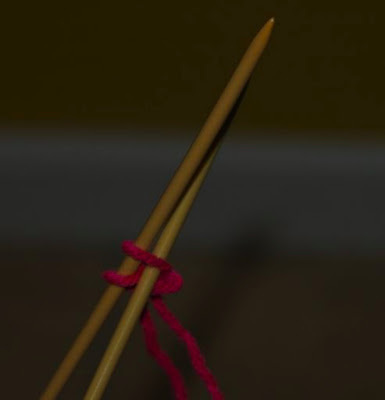 Take the long tail of the yarn and move it away from your body, below the two needles then up and between the needles. Now move the yarn down and towards your stomach. There is now a section of yarn between the two needles. Sound familiar? You are following the same steps as you did with the last cast on stitch. Take a hold of the long tail and slip the button of the working needle from under the belt being careful not to let stitches slip off. Continue as you did for the second stitch. Hold the long tail and working needle and slide the tip down the holding needle to pull a new loop/stitch through the old loop that is currently around both needles. But not the next. This new loop needs to be put over the tip of the holding needle. 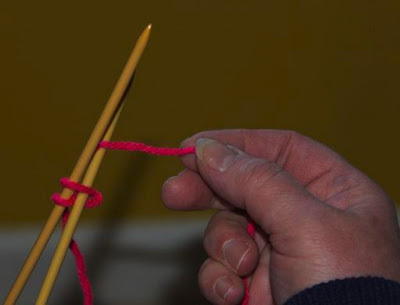 Hold the new loop with your first finger and use your second finger control the loops on the holding needle. Move the new loop up and on to the holding needle, then pull the working needle free. Scoot the three stitches down the holding needle till you feel that they will not slip off. Continue casting on until you feel you know how to cast on. Pull yarn from the skein as you need. Use the belt to keep the yarn as tight or as loose as you want to help with your style of knitting.